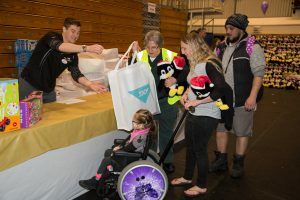 Each year, New Plymouth’s Special Children’s Extravaganza plays host to a selection of children from across Taranaki and Whanganui, providing them and their families time out from the stresses of their day-to-day lives. Many of these children are living with a life-threatening illness, physical challenges or other adversity, and the event is all about letting them focus on simply being children for a day. Bouncy castles, games and face paint – all sorts of fun at this year’s New Plymouth Special Children’s Extravaganza. From live performances and dancing to food stations, rides, games and bouncy castles, the day is certainly a fun day out for all involved. There is even the famous ‘toy cave’ where children are given toys and gifts – arriving through one end with nothing in hand, and leaving out the other with an oversized bag filled with goodies! One lucky girl with her goodie bag. “We have so many children coming through who have never been given a toy or gift to call their own before,” says event coordinator, Catherine Denton. 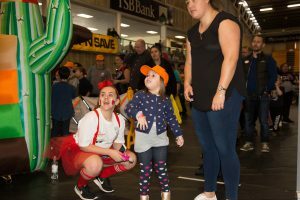 This year marked the 14th year of success for the Special Children’s Extravaganza, with 726 attendees descending on the TSB Stadium in New Plymouth. On the day, everything attendees see and enjoy is provided through the support and sponsorship of local businesses or donations, and Todd Energy is pleased to have been able to support this event for a second year. A small team of six champions are fully responsible for pulling the day together. “Many people think we’re sitting in a big office full of people, but in actual fact we have a really small office that only holds the six of us,” Catherine says. “Tania and I spend the first 7 months of this year reaching out to businesses in the wider Taranaki and Whanganui areas trying to secure sponsorships, donations, product and every other thing you could think of that might be needed to be able to host an event of this size and scale. 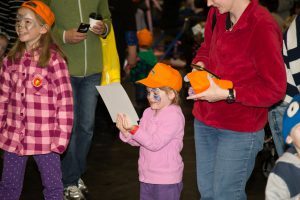 The event isn’t just a chance for the children to enjoy a fun day out – it also allows their siblings, parents and caregivers an opportunity to relax and enjoy themselves in a safe environment. Families are also encouraged to form relationships and build support networks – often it’s a great way to meet people in similar circumstances, share stories and provide support and wisdom to those in need. Todd Energy is grateful to have been able to contribute to this truly special event. It was a day unlike any other, with so many smiles, so much laughter and memories to last a life time. Thank you to the team at the Children’s Extravaganza for bringing the event together, and to all other sponsors and supporters for making the day what it was – we’re already looking forward to being a part of the 2019 celebrations.